John S. McCain (DL-3) originally designated DD-928 but reclassified in 1951 was launched by Bath Iron Works Corp. Bath Maine 12 July 1952 sponsored by Mrs. John S. McCain Jr. daughter-in-law of Admiral McCain; and commissioned 12 Oct ober 1953 at Boston Naval Shipyard Comdr. E. R. King in command. John S. McCain spent the first year of her commissioned service undergoing sea trials and shakedown training in the Atlantic and Caribbean. One of the new Mitscher class of large and fast destroyer leaders she carried the latest in armament and embodied new ideas in hull design and construction. The ship arrived Norfolk 19 May 1955 to begin service with the Operational Development Force in testing new equipment and tactics. She operated out of Norfolk until 5 November 1956 when she steamed from Hampton Roads bound for the Panama Canal and San Diego. After her arrival 4 December 1956 she spent 5 months on maneuvers in California waters. The frigate sailed for her first Far East cruise 11 April 1957 and after a visit to Australia joined the Formosa Patrol helping to prevent a military clash between Nationalist and Communist Chinese forces. She returned from this important duty to San Di ego 29 September 1957. John S. McCain steamed to a new homeport Pearl Harbor in early 1958 and took part in fleet maneuvers and antisubmarine training for the next 8 months. In early September the ship deployed to the Formosa-South China Sea area to help the 7th Fleet deter a possible Communist invasion of Quemoy and Matsu Islands. She remained in this critical region until returning to Pearl Harbor 1 Mareh 1959 having again demonstrated the power of the 7th Fleet to defend United States and her allies. The veteran ship made her third deployment to the Far East in the fall of 1959 departing 8 September nnd moving directly to the coast of troubled Laos. Here again the presence of American ships helped to stabilize the situation. During October she was of f Calcutta India carrying antibiotics and donating food and money to flood victims. In January 1960 the versatile ship rescued the entire 41-man crew of Japanese freighter Shinwa Maru during a storm in the South China Sea. Returning to Pearl Harb or 25 February she began a well-earned period of overhaul and shipboard training. John S. McCain departed 7 March 1961 for another deployment with 7th Fleet spending 6 months off Laos and Vietnam helping to thwart Communist designs on the strategic area. She resumed operations in Hawaiian waters after her return to Pearl Harbor 25 September 1961. With the resumption of atmospheric nuclear testing by Russia some months later the United States went ahead with plans for her own series of Pacific tests and John S. MeCain steamed to Johnston Island 27 April 1962 to take par t in the experiments. For the next 6 months she operated between Hawaii and Johnston Island departing for her next cruise to the Far East 28 November 1962. There she returned to patrol duties in the South China Sea and Gulf of Tonkin buttressing the Sou th Vietnamese government in its fight against the Viet Cong. She also took part in the Formosa Patrol in the Straits before returning to Pearl Harbor 16 June 1963. Antisubmarine warfare exercises followed and the ship got underway again 23 March 1964 for operation with a hunter-killer group in Japanese and Philippine waters. During this cruise she took part in exercises with ships from other SEATO nations as well as units of the 7th Fleet. John S. McCain returned to Pearl Harbor 11 August. She ope rated in Hawaiian waters until the spring of 1965. She was reclassified DDG-36 15 April and returned to the West Coast. In August the frigate returned to Pearl Harbor and then sailed on a 6-month deployment in the western Pacific. In the fall John S . McCain steamed off South Vietnam. On 24 November she shelled Viet Cong positions. Two days later she sailed to Hong Kong and ended the year in Japan preparing for further action in the cause of peace and freedom. 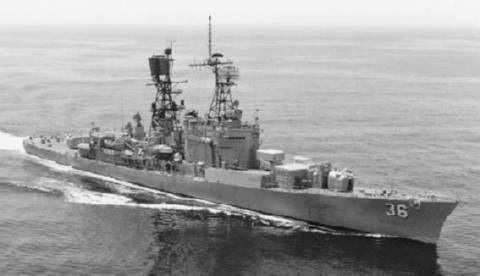 After further operations in the Orient early in 1966 John S. McCain returned to the East Coast and in June decommissioned for conversion into a guirled missile destroyer DDG-36 at the Philadelphia Naval Shipyard. Philadelphia where she remained into 1967.